Water Cooled Chiller – TEMPEST, Inc.
Because a chiller creates such powerful and efficient cooling, it can be installed in close proximity to a machine that might otherwise overheat and malfunction after repeated or continuous use. This cooling process makes factories more efficient and prevents unnecessary damage or equipment failure. To start the cooling process, a water cooled chiller begins its cycle in the evaporator where liquid refrigerant flows over the tube bundle and quickly evaporates, causing heat from the chilled water to be absorbed into the evaporator tubes. The compressor draws the refrigerant vapor out of the evaporator and then pumps it to the condenser to raise both its pressure and temperature. Custom Water Cooled Chiller – TEMPEST, Inc. When the refrigerant condenses in the tubes, it is forced to give up its heat to the cooling water. This highly pressurized liquid then moves through an expansion device that reduces the pressure and temperature as it enters the evaporator. This cycle is repeated over and over to continually chill an area. Industrial water cooled chillers must be regularly maintained to repeat this process as efficiently as possible. Water cooled chillers are essential in numerous industrial applications where machinery must operate under harsh conditions. The process of water cooling used in a chiller is also very similar to the process used for residential and commercial air conditioning units to cool a room or an entire building. High efficiency chillers are now being manufactured to provide the same benefits without dramatically raising energy costs in commercial facilities. Municipal utility providers also make use of industrial water cooled chillers to cool large systems and major public building complexes within a district. The benefit of a water cooled chiller in a factory is that it helps create a precise and highly controllable environment where thermal concerns can be managed. 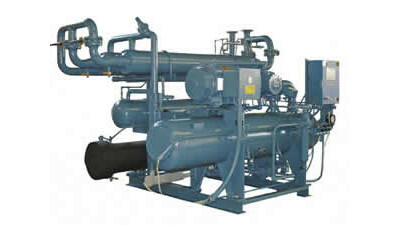 Water Cooled Chillers A water cooled chiller is a refrigeration system that is used to cool liquids in a wide range of commercial and industrial facilities. Within the chiller are contained the essential components: an evaporator, a condenser, a compressor and an expansion valve. 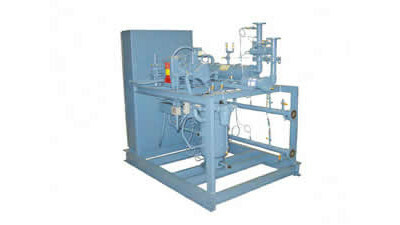 Water cooled chillers are often used in industrial settings to keep mechanical equipment cool while it is being used.